Kete teme e hap kushtuar evidentimit dhe grumbullimit te njohurive tona ne lidhje me ngjashmerine toponomastike dhe onomastike pellazgo-iliro-shqiptare ne ishullin e Britanise se Madhe. Iliret, Thrakasit, madje dhe Trojanet apo Frigjet thuhet se e shkelen kete ishull. Le te grumbullojme me shume materiale per keto ceshtje! Sikurse, Thrakasit & Ilirët edhe Piktët praktikonin tatuazhet në trup, për dallim prej Keltëve të cilët nuk e praktikonin një gjë të tillë (Praktika e stërlashtë e tatuimit ka mbijetuar gjër vonë në malësitë shqiptare). Nëse tatuimi ka qenë karakteristika e dukshme e tyre, si banorët e vetëm të ishullit që tatuoheshin, atëherë etnonimi i tyre Piktë mund të shpjegohet përmes gjuhës shqipe gjegjësisht fjalës 'pikë' d.m.th shenjë e lyerjes, vizatimit të trupit ose gdhendjës së motive ornamentale në gur e dru duke pasur simbolin e pikës si tipar thelbësor.. Ka mundësi që emërtimi Piktë të jetë një ekzonim (një emërtim i jashtëm i atij populli; emri qysh thirret një popull prej të tjerëve fqinjë të afërt a të largët) ku ilirët, thrakasit apo edhe trojanët i emërtuan ata. King Lud (73 BC) re-named it "Caer-Ludd" (Lud's Town). It later became known as Kaerlundein and then London. When Lud died, he was buried near a gateway called Porthlud, which the Saxons called Ludgate. The re-naming of the city has been a disaster for British history. Not only have we forgotten our links with ancient Troy, but we have also given ground to the advocates of evolution, who don't want us to know that, through the Trojans, we can trace our ancestry all the way back to Noah. The story begins with the city of Troy in Asia Minor (now eastern Turkey), near the Bosphorus. The Trojans were at war against the Greeks, and they thought they had won. They found a large wooden horse outside the city that the Greeks had left behind, and they brought it into the city as a trophy, not knowing that it was full of Greek soldiers. During the night, when the Trojans were all asleep, the Greeks came out of the horse and opened the city gates, so that the Greek armies entered and destroyed the city. This happened during the reign of Priam, the last king of Troy, about 1182 BC. The Trojans and Dardanians were allies, and there were intermarriages between their royal families. Aeneas was the son of Anchises, the leader of the Dardanian army. He married Creusa, the daughter of Priam, King of Troy, and they had a son called Ascanius. Aeneas and Creusa were third cousins, and their common ancestor was Tros, who founded the city of Troy. When the city was destroyed, Aeneas escaped with his father Anchises and his young son Ascanius, together with many other refugees, but Creusa got lost in the confusion. They first went to Africa, and then to Italy where they were well received by Latinus, king of the Latins. Aeneas married Lavinia, the daughter of Latinus and they had a son called Silvius. The journey of Aeneas to Italy, and his assimilation among the Latins, was later to become the subject of Virgil's Aneid, written between 30 and 19 BC, so that he became immortalised in Roman literature. Brutus went to Greece where his royal lineage was recognised by Pandrasus, king of the Greeks, and by the downtrodden Trojans who had escaped from Troy and were living as an under-class among the Greeks. The Trojans adopted him as their leader and assembled themselves into an army. He went to Pandrasus and asked for their liberty, so that they could live as equals with the Greeks, or else be given assistance to go to other lands. Pendrasus was enraged by this request and went to war against the Trojans, but Brutus prevailed against him. Pendrasus was anxious to achieve a peace of some sort, but he recognised that the war had led to feelings of resentment that would make it impossible for the Trojans to continue living among the Greeks. He therefore decided that the departure of the Trojans was the only possible option, and he furnished them with ships so that they could leave. He also gave his daughter Ignoge to Brutus, to be his wife. Brutus and his army sailed away and stopped in a few parts of Africa, then they sailed through the Pillars of Hercules (Straits of Gibraltar) and arrived in Gaul where they picked up some Trojan exiles. They fought some battles against the Gauls, then returned to their ships and sailed to their intended destination, an almost empty island to the north of Gaul known as "Alban" (Albion), which means "White Island". Those who came with Brutus were called "Britons", and the island became known as "Britain". 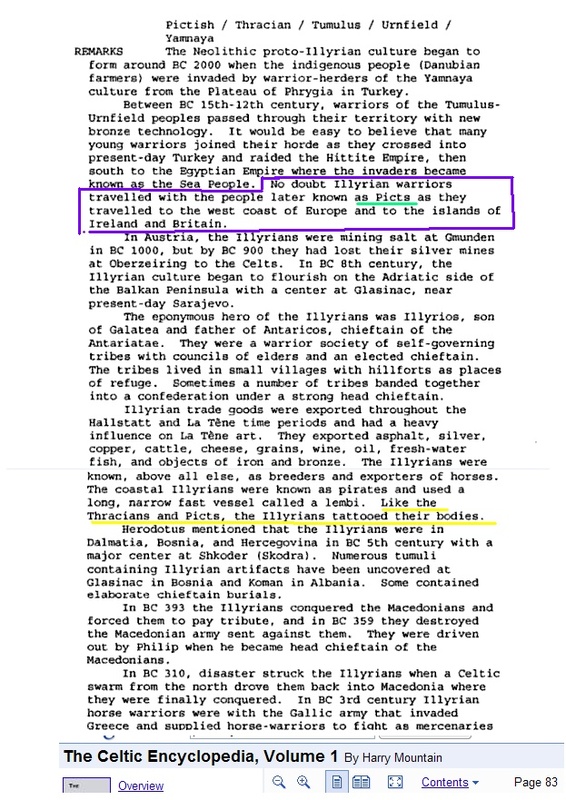 The date of their arrival is calculated to be 1074 BC, according to a footnote by Peter Roberts in his translation of Tysilio's "Chronicle of the Kings of Britain" (1). Brutus was a Trojan on his father's side and Latin on his mother's side. He was married to a Greek, so his descendants were Trojan, Latin and Greek. He was the first of a long line of kings, some of whom intermarried with other European royal families. Brutus founded a city on the Thames and called it "Troia Newydd" (New Troy). It retained the name for a long time, but later became corrupted to "Troynovant" or "Trinovantum". King Lud (73 BC), fortified the city and annexed lands to it, and re-named it "Caer-Ludd" (Lud's Town). It later became known as Kaerlundein and finally the Saxons called it London. When Lud died, he was buried near a gateway called Porthlud, and the Saxons called it Ludgate. The change of name was a cause of disagreement between Lud and his brother Niniaw who opposed the change. Gildas also wrote at length about it (according to Tysilio). It would be unfair to throw the Bible at Lud, because he was a pre-Christian pagan, but if he had been wiser he would have taken account of Proverbs 22:28. Comparing this with a similar verse in the next chapter (23:10), the context is the theft of land, but we see that Lud was annexing land to London, so it seems appropriate. The conseqence of the change of name has been a tragic loss of history. London was associated with Troy for about a thousand years, but it has been so expertly forgotten that hardly anybody today knows that the Britons came from the Trojans. Yet the British people still have an affection for Troy and like to hear the epic tales of Sparta, Greece, and the Trojan Horse. We would do well to remember our ancient history, not just for its own sake (and to remember our mistakes), but in this case it helps us to remember the mother of all histories, which is our descent from Noah and the dispersal fo the nations after the flood. The people who have documented our pre-Roman history include Geoffrey of Monmouth (2) and Nennius (3). Geoffrey is despised and discarded by many historians, because he claimed that his "History of the Kings of Britain" was a translation of a "very ancient book" which (supposedly) no-one can find. Nennius, who wrote a similar history, although much shorter, is thrown into the same trash-can. However, this rash treatment is unjustified, because Tysilio's Chronicle is very likely to have been Geoffrey's source material, and he wasn't just making it up. The argument in support of Tysilio was given in a paper called "Neglected British History", presented to the British Academy in 1917 by Flinders Petrie (4). Of course it is convienient for the purposes of evolution to discard all these histories, because Nennius gives us, not just the history of the Britons and their descent from the Trojans and Dardanians, but also their descent from Noah. Nennius is not alone in making this type of claim. The Saxon Chronicles give the lineage of Woden back to Sceaf (pronounced "Sheaf"), who is thought to be Japheth, the son of Noah. A number of Saxon genalogies are given by Cooper (5). The Celtic kings of Ireland can be traced back to Noah, through the line of Magog.(6),(7). This gives the astonishing result that some people in Ireland, if they belong to an ancient clan, can trace their personal ancestry back to Noah. Some of these genealogies are fragmented (and history is always like that) but they all tell us the same thing. The pre-Christian pagans knew that they had descended from someone who built a boat and survived a Flood while the rest of the world perished. None of these sources come from either Judaism or Christianity. They come from people who never saw a Bible, never knew that such a book existed, and have their own histories which are as old as the Bible itself. There is plenty of scientific evidence for the Flood, and much historical evidence as different cultures around the world have their own stories about a family on a boat. Now the British and Irish have an opportunity to investigate their descent from Noah, and for those who live in England and Wales, the challenge is to recover our pre-Roman history, and particularly our ancient link with Troy. 1. Chronicle of the Kings of Britain. Translated by Peter Roberts in 1811 from the Welsh copy attributed to Tysilio. Facsimile reprint by Llanerch Publishers. ISBN 1-86143-111-2. Note: This document is associated with the name of Tsysilio, although it was not necessarily written by his own hand. It comes from Brittany where Tysilio spent the last few years of his life, and he died there in 640 AD. At the end of the book, the death of Cadwallader in 688 is recorded, so at least this part of it could not have been written by Tysilio, but possibly by some of the monks in the monastery that he had founded. 2. History of the Kings of Britain. Geoffrey of Monmouth, 1136. Translated by Lewis Thorpe. Penguin Classics. ISBN 0-14-044170-0. 3. Nennius: Historia Brittonum, 8th century, Giles translation, Medieval Sourcebook. 4. Neglected British History. Flinders Petrie, FRS. Proceedings of the British Academy, Volume VIII, pp 251-278. Paper presented to the Academy on November 7, 1917. 5. After the Flood, Bill Cooper, New Wine Press, 1995, ISBN 1-874367-40-X. 6. The Illustrated History of Ireland, Cusack, 1868, Facsimile reprint by Bracken Books, London, 1987. 7. The History of Ireland. Keating, 1634, Dublin, 1902-14. Copy available in the Guildhall Library, London. BRIGANTES:Les Brigantes de l'Angleterre paraissent avoir une origine THRACE. BRIGANTE-t:Brigantë-t të Anglisë duken sikur të kenë pas prejardhje THRAKE. Materiali qe dua te postoj nuk eshte per "emra vendesh" ne Britani por mendoj qe eshte afer me idene e ketij seksioni pasi sjell "emra popujsh" te lashte qe kane udhetuar nga Mesdheu dhe jane vendosur ne Britani. Dy grupet "Epidii" dhe "Damnii_Albani" jane vendosur ne Britani ne zonen bregdetare "Argyle" e cila njihet per mjeshterine e prodhimit te objekteve prej balte te pjekur (qe prej lashtesise) dhe per depozita te medha te lendes se pare per kete pune, argjilit. Pjesa per te cilen flas lidhet me kroniken e shkruar nga 'Richard of Cirencester'. TeuAL wrote: . Dy grupet "Epidii" dhe "Damnii_Albani" jane vendosur ne Britani ne zonen bregdetare "Argyle" e cila njihet per mjeshterine e prodhimit te objekteve prej balte te pjekur (qe prej lashtesise) dhe per depozita te medha te lendes se pare per kete pune, argjilit. Uroj te behet objekt studimi ! TeuAL wrote: Materiali qe dua te postoj nuk eshte per "emra vendesh" ne Britani por mendoj qe eshte afer me idene e ketij seksioni pasi sjell "emra popujsh" te lashte qe kane udhetuar nga Mesdheu dhe jane vendosur ne Britani. Dy grupet "Epidii" dhe "Damnii_Albani" jane vendosur ne Britani ne zonen bregdetare "Argyle" e cila njihet per mjeshterine e prodhimit te objekteve prej balte te pjekur (qe prej lashtesise) dhe per depozita te medha te lendes se pare per kete pune, argjilit.